Amylulita says...: SCVNGR Hunt En Tu Ciudad: Win a Car, iPads, Tickets, Discounts, and more! SCVNGR Hunt En Tu Ciudad: Win a Car, iPads, Tickets, Discounts, and more! 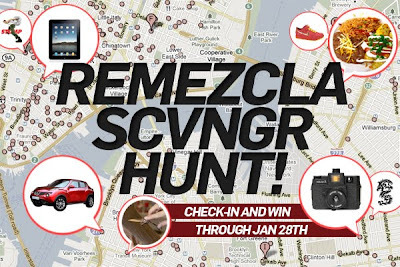 Remezcla.com teamed up w/ Nissan and SCVNGR to build a fun scavenger hunt in NY, LA, SF, and Chicago. Some of the prizes are pretty sweet - iPad, Nike Sneakers, Free haircuts, designer t-shirts, concert tickets, Cameras, and a Nissan Juke car. Only catch is you need an iPhone or Android to play the game. I own a Blackberry so that counts me out, BUT it doesn't stop me from getting excited for everyone else!